Creamy roasted cauliflower soup is a healthy comfort food that will warm you up on a chilly day! 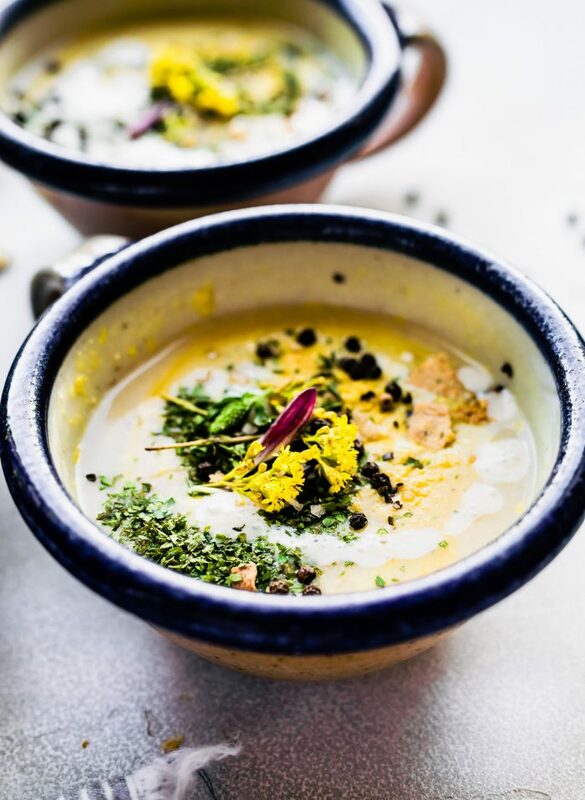 Made with a hefty dose of fennel for bone density, anti-inflammatory properties, and gut health, this vegan cauliflower soup is also gluten free, grain free, dairy free, and low carb. Thought you should know that this roasted cauliflower soup post is sponsored by my friends at Bob’s Red Mill. They’re awesome to me, so thanks for being awesome to them in return! We did it! We made it to Fall and all of a sudden the temps dropped. It’s a crisp 70F with a low of 45F. Ohhhhh it on, and soup weather is so here! Plus all the seasonal veggies. 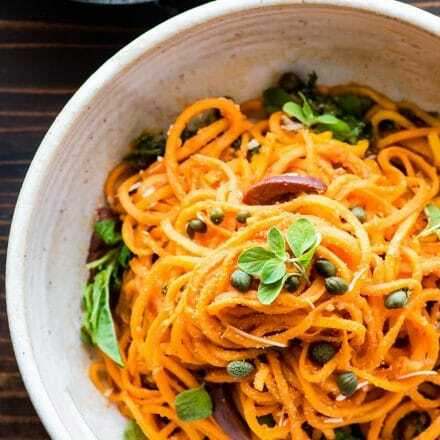 LOVE LOVE LOVE me some squash, persimmon, cauliflower, fennel, carrots, sweet potato… I could go on! But that’s not what we’re here to talk about today. Well, maybe just a little. The whole focus of this post? Is SOUP! 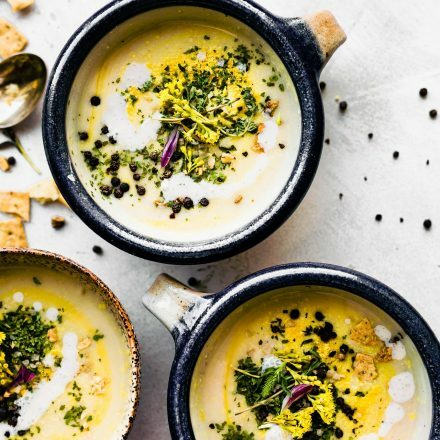 How to make “cheesy” vegan soup (that’s also paleo friendly). Yep, Soups on! You ready? First up, let’s talk VEGAN soup recipes. 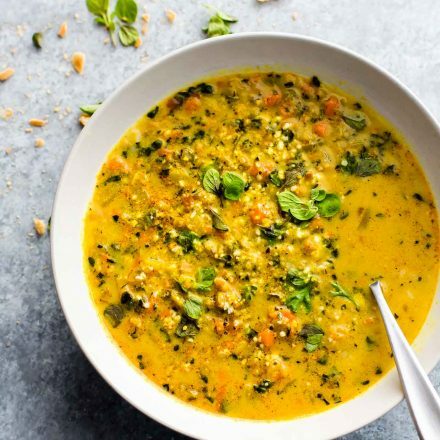 Have you ever tried to make a “cheesy” or creamy plant based soup, but were disappointed that it didn’t have that thick, creamy consistency you expected? I feel ya. Creamy soups are usually made with heavy cream and cheese. If you’re eating dairy free and/or vegan, obviously, those ingredients aren’t options. Never fear… help is here! There are some important but simple, plant-based ingredients that will create a thick, creamy vegan friendly soup. Another vegan product I use in this roasted cauliflower soup is nutritional yeast. 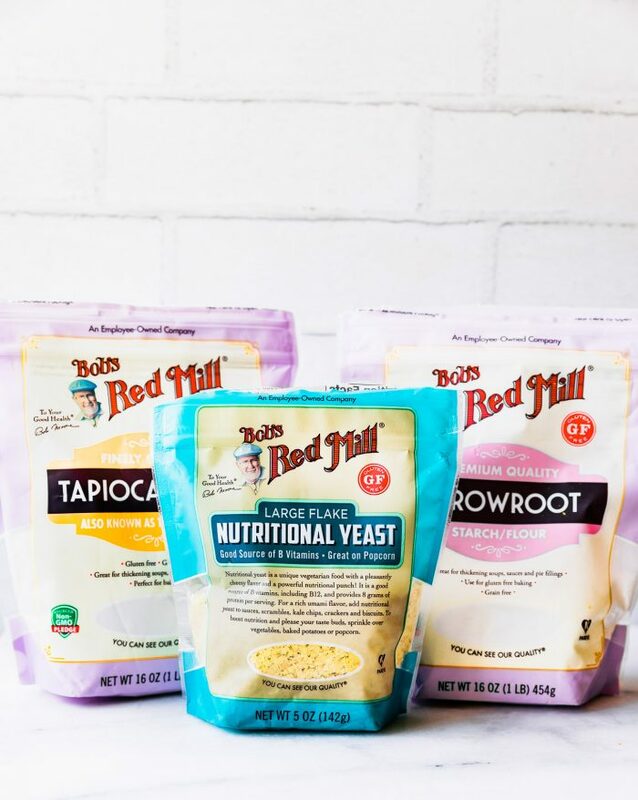 Obviously Bob’s Red Mill is our favorite! 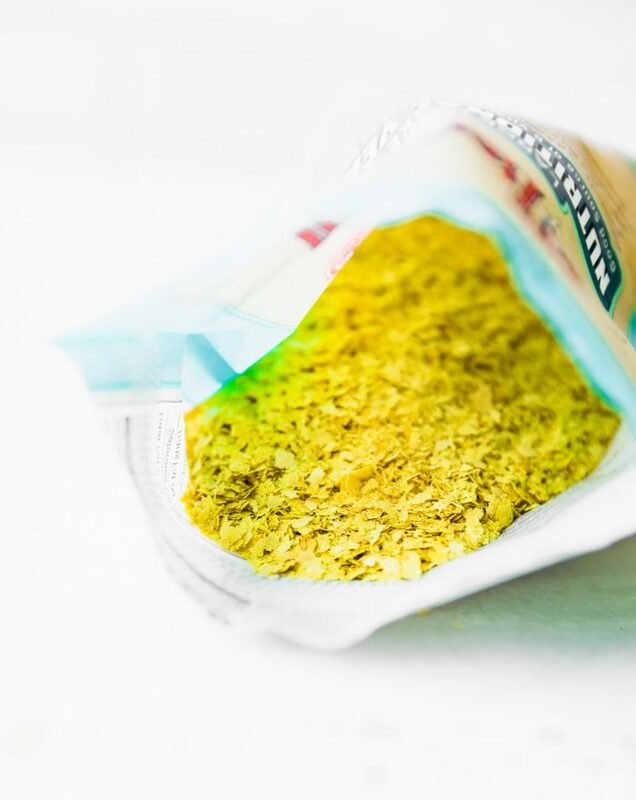 I use nutritional yeast to add a “cheesy” taste, and for the health benefits. It’s a great cheese replacement for pesto, sauces, and pizza toppings too! What are the health benefits of this “cheesy” flake? Oh, lemme tell ya! Nutritional yeast delivers protein and B vitamins, both of which are important for a vegan and vegetarian diet. Arrowroot starch or tapioca starch will help thicken the soup naturally. No need for corn starch or a grain here. Both of these starches are naturally gluten free, grain free, and legume free! Timing is key with these ingredients, though. 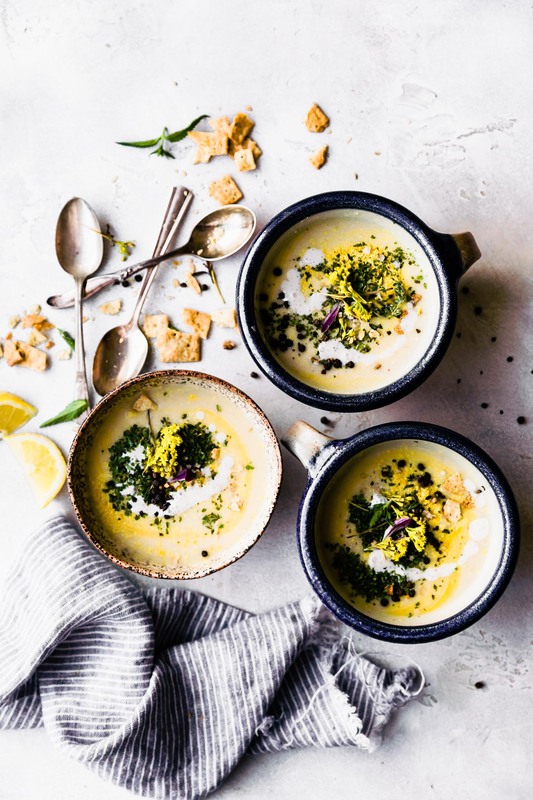 If you add the plant based thickener too late in the making of the roasted cauliflower soup, it won’t have that chowder-like texture you want. And if you add it too early, you’ll end up with a consistency that I can only call vegan roasted cauliflower soup wet concrete. Haha! Alright, let’s put it all together now. Cook and watch it thicken… ahhhh! 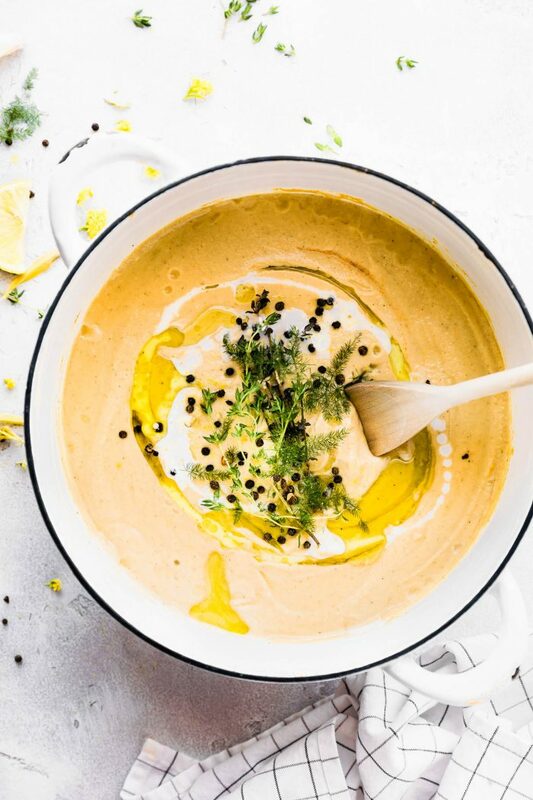 This creamy roasted cauliflower soup is made with a hefty dose of fennel for bone density, anti-inflammatory properties, and gut health. This vegan cauliflower soup is also gluten free, grain free, dairy free, and low carb. Optional non dairy cream or coconut cream to top. Preheat oven to 450F. Cut cauliflower into pieces or florets. Slice off the stem of the fennel and cut lengthwise into sections. 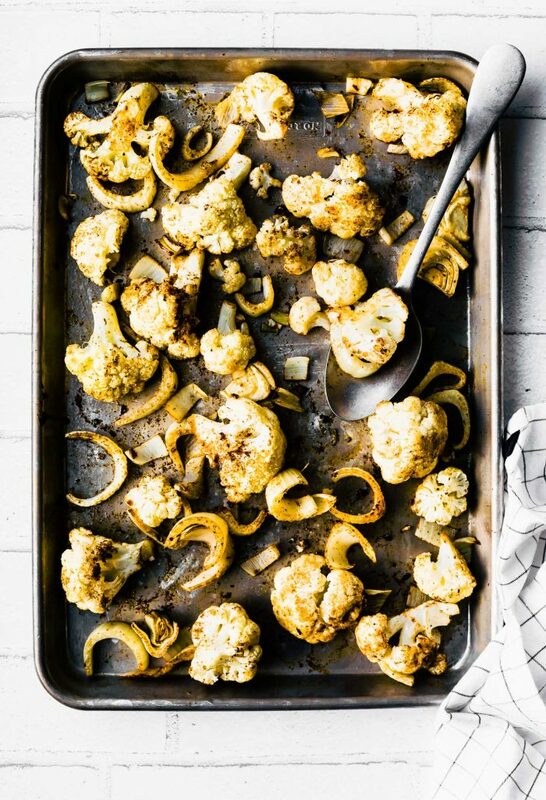 Toss cauliflower and fennel is 2 to 2.5 tbsp olive oil, balsamic, and spices and spread out evenly on baking sheet. Roast for 20-25 minutes, turning over veggies halfway. Remove from oven and carefully place all ingredients into a blender. If you don’t have a blender, set aside and see notes. Add 1 pint of vegetable broth to blender (3 cups) and blend until combined. Next add in your 8 ounces of almond or coconut milk and blend again until you get a creamy base. The more milk you add, the thinner the soup base will be. Set aside. In a large stock pot place a few sprigs thyme, garlic, butter, and sauté for 3 minutes on medium. Next add your roasted cauliflower fennel soup mix to the pot the butter and garlic.. Scrape the blender with a spatula to get everything out. Add a dash more salt and pepper and bring to a boil. Reduce and then slowly mix in 1 tbsp arrowroot starch, whisking while you add. Lastly, mix in nutritional yeast (3-4 tbsp) and simmer for another 15 minutes. Optional: drizzle olive oil and non dairy milk or coconut cream. Salt and peppercorns to garnish. If you don’t have nutritional yeast and can handle dairy, Parmesan can be substituted, but it will not have the same health benefits. And if you don’t have arrowroot starch, potato starch or tapioca starch may be used. If you don’t have a blender, you can use an immersion blender. I recommended adding the ingredients into pot, after the cauliflower/fennel is roasted, little by little and blending with immersion blender. The starch will be added last before you boil again. Okay, have I convinced you? 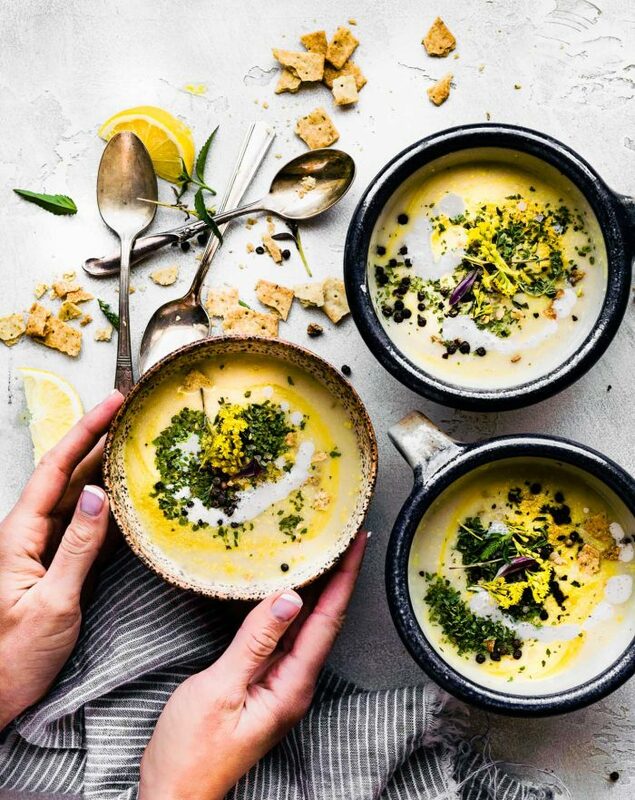 Creamy soups, creamy cheesy vegan soups, extra thick and extra healthy —> they do exist and can easily be made right in you kitchen. Mwah! 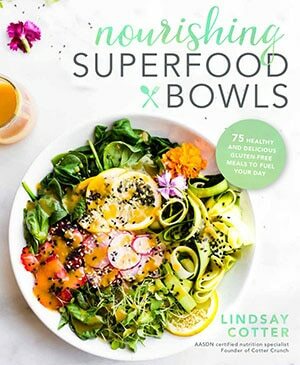 I totally love cauliflower Lindsay! I’ll definitely be giving your recipe a try! wonderful! Keep me posted Mary Ann! Thanks, Tara! Fennel just has the best flavor. You’re so gonna love this one! Woah, this looks incredible! 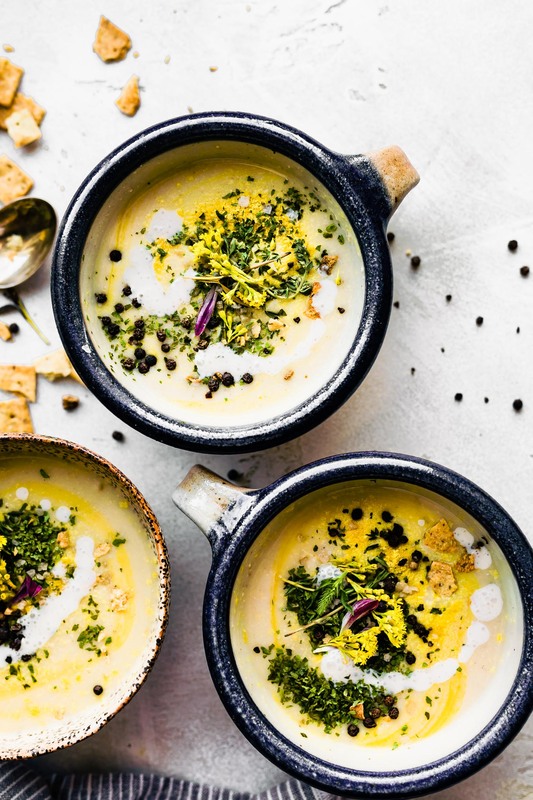 Roasted cauliflower has the best flavor, so I bet this soup is DELICIOUS! Cauliflower is my JAM! 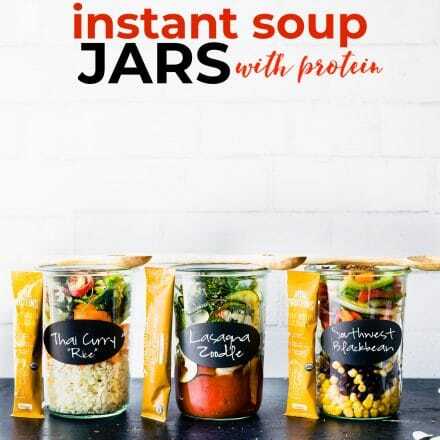 I totally need to try it in soup – sounds SO good! Isn’t cauliflower so good? It definitely makes this soup. Keep me updated on how it goes! I so agree! Thanks Suzy. I cannot WAIT until it is chilly enough to want soup. Pinned this for when that day finally comes. It is coming, right? I think you just need to come visit, Fall is here! I love the flavors, and the healthy aspects! Super simple! (Always a plus when it comes to soup making) Lots of flavor & filling! Oh my goodness the roasted cauliflower in this soup is so fantastic. For some reason I have been craving cauliflower a lot lately so this is a must! 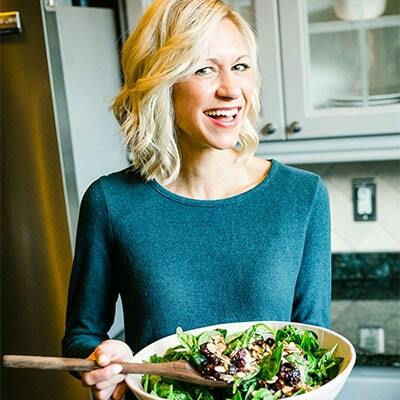 Hi…Lindsay…Your soup is really awesome & looks sooo yummy and creamy, i will can’t make this soup….Thanks for sharing…and keep shard your new amazing ideas…..! GAHHH nutritional yeast makes EVERYTHING more flavorful! I live for adding it to all my savory dishes. Heck, I’ve seen cinnamon roll recipes with nutritional yeast for the cream cheese frosting. Anyways, this looks like a fantastic and comforting soup recipe that I would love to dig into! Roasted cauliflower adds the perfect smokiness and depth that would taste a million times more delectable than just boiled cauliflower too! This soup has me SO excited for soup season!! The recipe says – if you don’t have a blender see notes – but there don’t seem to be any…? I haven’t found any nutritional yeast yet but am planning to try this & hoping my son will eat it – he won’t eat soup with lumps in! oh sorry about the Dorcas! I will update. Do you have a hand blender or immersion blender? I just printed out this recipe and I’m looking forward to trying it! It sounds delicious and looks gorgeous too. 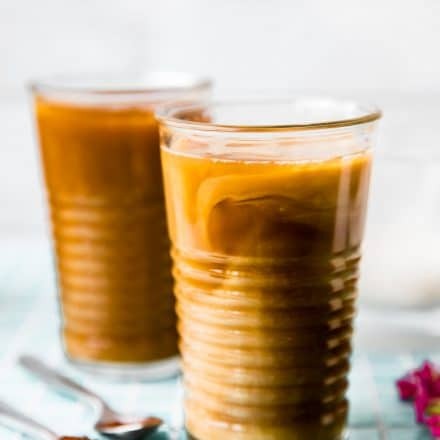 Just a note, however, for something you might want to correct in your recipe: A pint is actually equivalent to 2 cups, so I would simply delete your references to the pint and simply list the vegetable broth amount as 3 cups. Oh gosh! thanks for catching that. Probably a typo! This looks really comforting! Perfect for fall nights! I’m trying in this weekend thank you for this recipe sweety.